The term “Gray’s Anatomy” has become synonymous with the popular ABC show featuring surgeons who have ridiculous amounts of drama while somehow still finding time for the OR. I’ve only seen one episode of the show, and would describe the main character as a black hole for drama, but anyways, before the show, “Gray’s Anatomy” was synonymous with gross anatomy, a very familiar text with medical students. 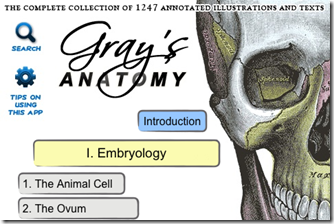 The full version of the Gray’s Anatomy text has now gone mobile and is ready to use on your iPhone. There are a few versions of this app out, but I’ll be reviewing the Deluxe version. In this review I’ll focus on how useful it might be for gross anatomy during the first year of medical school. I preface this review by saying I’m not a huge fan of the Gray’s Anatomy book. Instead, I was a huge fan of the Netters Anatomy text during my first year of medical school. Netters has vibrant colors and beautiful illustrations that made gross anatomy significantly easier for me to understand. On the flip side, I found the Gray’s Anatomy book to be more functional, and significantly less aesthetically pleasing. There are actually Netters Anatomy Flash Cards already in the App Store. We have reviewed one of their apps already on this website, the Musculoskeletal app. 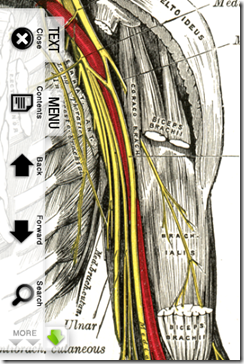 The problem is all the Netters Apps are divided into sections, such as,“Musculoskeletal”, “Head and Neck”, and are only available individually. The nice part about this app is all of Gray’s Anatomy is present and the price is significantly cheaper as well at at $9.99. (Currently the App is on sale for $4.99). So I’ve already mentioned how I’m not a fan of the images present in the Gray’s Anatomy book, and you’d think the rest of the review here on out would be me bashing this app in favor of the Netters Anatomy apps. Well….not exactly. I was pleasantly surprised by this application. This app is pretty large, 402 mb due to to the thousands of pictures it contains, so make sure you’re connected to Wi-Fi when downloading this app. You can sense the size of the app because of the increased length in loading time. I have an iPhone 3gS, and this app takes the longest to load out of any apps I have, which is only a second or two longer than usual. I imagine it would take a few seconds extra to load on the 3G and 2G phones. When you open up the app you are presented with 3 main navigation areas. 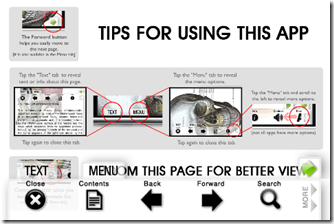 Search, Tips on how to use the App, and the basic table of contents. You quickly realize how crucial the “Tips on how to use this App” section is when you try to dive into the app with reckless abandonment. The Tips sections is definitely helpful and you realize the app actually has a pretty nice User Interface and Navigation built in. The navigation gives you a key toolbar when you are viewing images. The Menu selection allows you to go back/forward, search and access the index. There is also a key “text icon” that brings up information about the anatomic figure you’re looking at. I can’t stress how nice this text information is. 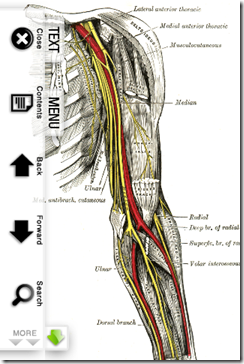 It gives you a descriptions of the anatomy you are looking at and gives you information on related anatomy. This text section is essentially where your gross anatomy test questions will come from, and this app does a beautiful job of laying out this information. The search feature is actually pretty nice once you realize how to use it. 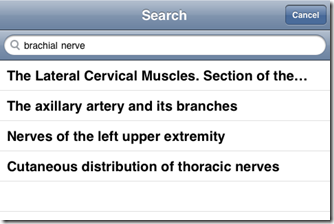 For this review, I searched for the brachial nerve. When I did this I got the option to view different anatomical pictures at different angles, as you can see from the pictures. Once you get the picture that you feel gives you the right angle, good luck finding what you’re looking for unless you know where to look. Gross Anatomy was 3 years ago for me, and I definitely forgot a lot of it. If you know what you’re looking for, and actively taking an anatomy class, then you’ll be able to use this portion of the app much better. Even though it took me a few extra seconds to find what I was looking for, again, I was extremely impressed by the text portion of this application. The text gave me information on all the nerves I was looking at, key innervations, and the nerve branches I need to know. When it comes to the pictures I refer you to the comments I made earlier, and the screen shots I have taken. The anatomy in this application is not readily identifiable and I would definitely not suggest exclusively using these images to study for your practical. Did I mention I really don’t like the images? This is probably not possible, but if the authors somehow went through and labeled the anatomic figures so they would be easier to identify. Again, this would understandably take forever to do, and its probably never going to happen, but if it did I would pay big money for this app. So I’ve made it painfully evident I’m not a fan of the pictures in this application and you should definitely not use this application as the sole way to memorize the anatomy you need. That said, the text provided in each image is rich and very informative. The text is not too long, but just right, and you get hit with key information you’ll need for your anatomy tests questions (e.g, innervation, branching, key related structures). Do I recommend this App? It depends. 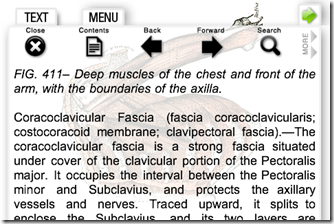 If you need a great anatomy app that has great content from a text standpoint, then yes, get it. However, if you are looking for an anatomy app with aesthetically pleasing pictures and one to help you for your lab practicals, then this is not that app. Now if the developers could add some of the labeling my opinion would change. The price of this app is another reason I would recommend it to the above people. At $9.99 (currently $4.99), this app is a great deal when compared to the Netters apps, which only give anatomy in sections. Each of the Netter Anatomy sections costs a whopping $39.99, pretty expensive for medical students. If this app was the same price as the Netter applications I would not recommend it, however, its clearly not. We’ve reviewed other Anatomy applications but they all failed to include key information about the actual anatomy you are reviewing. This application definitely excited us because it did not fall into this category. Hi again, need some suggestion, which of the following anatomy flash card do u think is better, is it the netters or grays? Because according to the price, grays is much more affordable compared to netters. Yea, definitely a bit of a tough decision there. Like I was saying in the conclusion, it really does depend on what you want to get out of it. I wouldn’t recommend the Gray’s Anatomy app if you really want to learn the anatomy for your practical. However, like I was saying, the text is a good source for the type of questions you’ll be asked during the anatomy test (not practical). Right now the app is $4.99 so probably not a bad idea to see if it’s suitable for your needs. If not, you can take the plunge and go for the Netters flash cards, $39.99. (remember, the $39.99 is not for the full anatomy, it’s only for each section, i.e. head/neck, musculoskeletal, etc, so it’s definitely a large investment)…it would be nice to see those prices lowered a bit for medical students.. These are the very old Gray’s figures (now out of copyright) and have nothing to do with the current Gray’s Anatomy that has been updated consistently for the last 150 years. I would avoid them and either go with the Netter’s app or the Gray’s Anatomy for Student’s app. Also iliifat you are giving totally wrong information here. The Netter app is for the whole body at $39.95. There are some separate versions for musculoskeletal etc but these are very detailed for people specializing in one area! I would also suggest you go and look at a real Gray’s Anatomy and not one of the facsimiles available of the 1918 edition or the equally outdated US version. Hi Britishbird. This article is a bit old now so some of the numbers I mentioned probably don’t apply anymore. The App Store is pretty dynamic so prices get changed around many times and new products enter, get modified, or leave. That said, you’re totally write, Modality does have an anatomy app for the full body at $39.99, although I’m not sure if it was created before this post – but thats really not the issue. In terms of Grays Anatomy, I meant what I said about the book. At least when I was a first year in medical school, I really didn’t like the book, and almost all my classmates, actually, all of us, went with Netters instead. Thanks so much for the comments and clarifying / updating the price points of Netters for our readers, much appreciated!